Do you remember the last time you put your feet up to relax? Think about how it felt to sit back and rest your feet on an ottoman, footrest, stool, or whatever is there to put your feet on. Ergonomic footrests provide the best solution for putting your feet up to relax your tired, aching feet, but they are also beneficial for your back and posture. Usually, you might consider sitting in a recliner with your feet up at the end of a workday. However, there is a multitude of reviews of footrests and many options online. We’ve done the hard work for you, so you can relax with one of these top ergonomic footrests. Our top pick for footrests is the Humanscale FM 300 Foot Machine Footrest. Not only is this footrest highly rated by users, it offers high-quality construction and features. The steel frame provides solid, stable support, while the non-skid surface ensures that your feet will not slide off. The adjustable height feature allows you to make the appropriate adjustments, so you can relieve pressure on your lower back and relax your legs and feet. The Humanscale FM 300 Foot Machine Footrest also allows you to rock/move your feet, which improves your blood circulation when you’re sitting. Humanscale offers a lifetime manufacturer’s warranty. The Econo High Portable Footrest offers a solid and functional design and is made from quality materials. Keep in mind, this is a footrest and not a footstool. It is sturdy and well-constructed but is not intended to be used as a standing stool. Prolonged sitting takes its toll on your body. This top ergonomic footrest for back pain is innovative, portable, and has foldable legs. Some users reported it to be a bit heavier than expected, even though it’s considered lightweight and portable. Many users with trouble reaching the floor when sitting find the Econo High Portable Footrest to be ideal for avoiding posture problems. Number three on our list of top ergonomic footrests for back pain is the Kantek FR600 Professional Adjustable Footrest. It offers several functional benefits and is a high-quality footrest. The features of the Kantek FR600 Professional Adjustable Footrest allow for comfort, correct posture, and correct positioning of your feet. A favorite user feature of this footrest is the massaging bumps. Some users claim the tilting motion is somewhat noisy. Avoiding foot and back fatigue at work helps you be more productive while you prevent aches and pains. If you like your Smartphone for its ‘smart’ features, this Kensington Soulmate Plus Adjustable Footrest for back pain uses SmartFit technology for optimal comfort. The Kensington Soulmate Plus Adjustable Footrest is, overall a high-quality, solidly constructed ergonomic footrest for back pain that offers optimal relief from sitting at work. 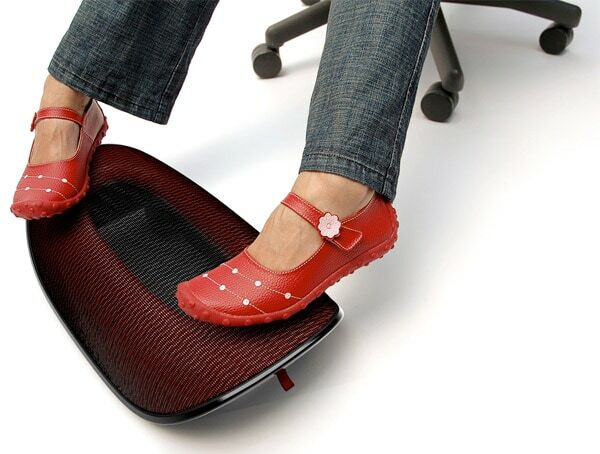 This foot rest eliminates pressure and tension at work when you need it the most. Not everyone sits all day at a desk. Some people stand for hours at a desk or station when they work. Therefore, this Ergodriven Topo Anti-Fatigue Mat has its place in the workplace for relieving foot, neck, and back pain and strain. It isn’t lightweight at 7 pounds, so it’s best if it’s used at one station. You can move it since it’s not very heavy, but it can be more challenging that lightweight foot rests. You have to move it every time you switch from standing to sitting, which is a challenge if you stand more than you sit. The Ergodriven Topo Anti-Fatigue Mat is best suited to people who stand a lot when they work. While it can be moved to accommodate most sitting positions, not everyone can benefit from that feature if they require more height. Overall, this is a functional and high-quality anti-fatigue mat ideal for those who stand to work or for those who still wash dishes in their sink. Hammocks are often associated with the beach or the outdoors, but what about using one for your feet when you work? SMAGREHO has a highly portable, mini office foot hammock you can use as your foot rest at work. The SMAGREHO Portable Mini Office Foot Hammock footrest is suitable for anyone who wants an inexpensive, but highly functional footrest for the office. Some users recommended that you install brackets to hang it on to avoid rope slippage and problems with it fitting your desk. It may be designed for any average desk, but not all desks are alike. It’s a good solution for anyone who travels for work and packs lightly. If you prefer a footrest that is comfortable, economical, and functional with or without your shoes on, the Rest My Sole Foot Cushion Footrest is a suitable option. It’s designed to help people who have issues with placing their feet on the floor when sitting, but it’s not adjustable. The Rest My Sole Foot Cushion Footrest affordable, comfortable, and offers many simple features that some high-tech foot rests offer. You don’t have to worry about getting it a little dirty sometimes because the cover is removable and machine washable. You can use it at home, at work, or when you travel because it’s lightweight and portable. The Webble Ergonomic Office Footrest is an innovative design with a patented mesh membrane and spring suspension. The Webble Ergonomic Office Footrest has been described as a theme park for your feet by some users because it’s fun for people who can’t keep their feet still when sitting. Here is some important information about the benefits of using a footrest. Your posture is vital to your neck and back health whether you’re standing, sitting, walking, or lying down. Improper posture leads to back strain, muscle cramps, and back pain. The position of your feet plays a role in improving your posture, therefore alleviating stress and tension on your neck and back, which results in less neck and back pain. When shopping for an ergonomic footrest for back pain, here are some helpful tips to consider. Most importantly, protect your neck, back, and feet from work-related fatigue by choosing the proper top ergonomic footrest for back pain.